"This is our second year in a row we have been awarded the outstanding excellence award from TripAdvisor. We have worked very hard to establish an exceptional customer experience by creating our award winning wines and have had a relentless focus on our customers&apos; experience at the winery. 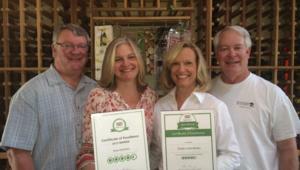 This is validation of our efforts," said Tim Anderson, owner of the winery. "This is a tribute to all of our employees including our two generations of family workers at the winery," said Sue Anderson, another owner. "We are a family business and we strive to treat everyone as family - our workers and customers." When selecting Certificate of Excellence winners, TripAdvisor uses a proprietary algorithm that takes into account reviews ratings to determine the honorees. Businesses must maintain an overall TripAdvisor bubble rating of at least four out of five; volume and recency of reviews are also taken into account. Additional criteria include a business&apos; tenure and popularity ranking on the site. "TripAdvisor is pleased to honor exceptional hospitality businesses for consistent excellence," said Marc Charron, president of TripAdvisor for Business. "The Certificate of Excellence award gives top performing establishments around the world the recognition they deserve, based on feedback from those who matter most - their customers. From Australia to Zimbabwe, we want to applaud exceptional hospitality businesses for offering TripAdvisor travellers a great customer experience." From left, Tim & Sue Anderson and Linda & Jim Anderson, family owners of Shady Creek Winery, display their recently awarded Certificate of Excellence from TripAdvisor.